Starchy Vegetables: Butternut squash, potatoes, pumpkin, sweet potatoes, etc. Whole Grains: Amaranth, barley, buckwheat, oats (steel cut or rolled), quinoa, rice (brown, red or wild), sorghum, spelt, sprouted grains or breads, wheat berries, etc. Legumes: Beans, chickpeas, lentils, peas, pulses, etc. Fruit: Apples, apricots, bananas, berries, cherries, grapefruit, grapes, guavas, lemons, limes, mangoes, melons, oranges, peaches, nectarines, persimmons, pineapple, plums, pomegranates, watermelon, figs, pears, kiwifruit. Carbohydrate-dense and provide a significant amount of carbohydrates per reasonable serving size or calorie amount (as opposed to the lower-calorie, lower-starch, and more fibrous kinds of carbs which we have listed as “colourful vegetables” on the Sleekgeek Food List instead). High in fiber so that they digest slower and are more friendly to blood sugar, hormones, satiety levels, and digestion. Nutritionally-dense, containing other vitamins, minerals, and phytonutrients that contribute to good health. If you would like to read more in-depth about smart carbohydates, you can do so here. For now, just know that we encourage a balanced intake of both carbohydrates and fats, coming from high-quality sources. At Sleekgeek, we know that we’ve got our work cut out for us, helping people better understand carbohydrates and figuring out how to fit them into a healthy, balanced lifestyle. In the Sleekgeek Coaching Program, we’ve found that getting clients to eat smart carbohydrates can be quite controversial. On one end of the spectrum, most people eat way too many carbohydrates (and the wrong ones). On the other end of the spectrum, some people have been conditioned to be scared of carbohydrates (because not much has been learned from the previous decade of incorrectly being scared of fat). Whenever there are two extremes, the answer usually lies somewhere in between. Yes, most people tend to eat too many of the wrong carbohydrates, but there is no need to fear them either. Instead, focus your meal around protein and vegetables, and then round it off with a small amount of smart carbs and healthy fats. Some other sticking points are that less processed cereal grains and whole grains need to become more well-known and popular as well as getting meat-eaters to understand that lentils and legumes aren’t just vegan sources of protein, they are also smart carbohydrate choices. Vegans can also take this opportunity to double-up on their protein intake, by choosing plant-based protein sources as their quality protein and then also selecting a smart carb that is also high in protein (you will find some foods are listed both as a plant-based protein and as a smart carb). How many smart carbs should you eat per day? Carbohydrate intake recommendations can vary dramatically from person to person. It’s influenced by factors such as how much you weigh, level of physically activity, goals, preferences, medical conditions, as well as who is doing the recommendations. In general, most people eat too many carbohydrates and too little vegetables, protein, and healthy fats. But that’s not to say carbohydrates are bad and that you need to cut them out completely. Healthline have a good article on “How many carbs should you eat per day to lose weight” which puts forward some good recommendations. However, it is a bit biased towards weight loss and lower-carbohydrate diets. Still, for most people it’s a good place to start. 100-150g of carbs per day as a “moderate” amount which is a massive improvement compared to what most people eat. 50-100g of carbs per day as a good place to be to more easily lose weight / maintain a healthy weight. 20-50g of carbs per day as a more aggressive range that borders on Banting / Ketogenic diet levels. Keep in mind that lower carbs does not necessarily mean more weight loss. Weight loss comes down to energy balance (calories in versus calories out). It’s still possible to overeat on fat, protein, and veg and gain weight, even if you’re only eating 20g of carbs per day. Similarly, it’s possible to lose weight eating 200g+ of carbs per day as long as your total calorie intake from fat, protein, and veg is within an appropriate amount. The most important thing is to find the amount of carbohydrates that helps you lose weight while still being a long-term sustainable strategy. Of course, telling people to simply “eat less and move more” in order to improve their energy balance is not that effective because it’s easier said than done. This can all get quite confusing and when you work with grams of carbohydrates it requires you to track the macronutrient content of your foods. Eating the right kind of carbohydrates in the appropriate amounts is one of the fundamental habits that we teach in the Sleekgeek Coaching Program. Once you build the necessary skills to navigate the buffet of carbohydrate choices out there, life becomes so much easier and you make much quicker progress. Carbohydrates can be energy dense and easy to over-consume, but moderate amounts from high-quality sources are healthy for us and can actually help us feel fuller and stay fuller for longer. 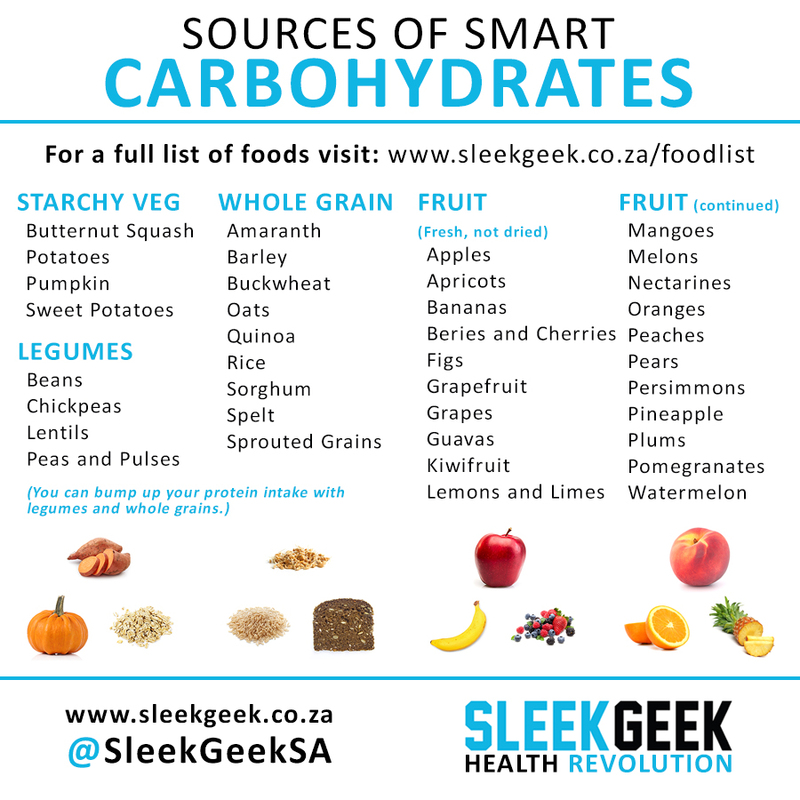 Print out the Smart Carbohydrates Food List above or the full Sleekgeek Food List and get to know which foods are smart carbohydrate choices. Stock up and make sure that you always have them conveniently on hand. See the Sleekgeek Kitchen Makeover and Supermarket Survival Guide for help on this. Stick to easy and convenient smart carbohydrates (buy them pre-prepped or pre-cooked if need be). Keep it simple and do-able. Try swapping out some refined carbohydrate for smart carbohydrate choices, or if you don’t usually eat carbohydrates then experiment with adding small amounts to each meal using foods that you actually like and are willing to eat. Work on making smart carbohydrate choices with every single meal, consistently. You don’t have to eat smart carbohydrates with every meal, but if you are eating small moderate portions then it definitely can be appropriate. Focus on getting the right amount of smart carbohydrates, using the Sleekgeek Portion Control Guide. Experiment with different types of smart carbohydrates and see if you can expand your variety of choices. Try improving the quality of your smart carbohydrates – such as by buying organic, minimally processed, and food that has been sourced locally. Don’t forget that smart carbohydrates are just one part of your meal. See the Sleekgeek Healthy Meal Template for a broader perspective and work on building up a healthy well-balanced meal. Make sure that you ALWAYS have a handful of go-to smart carbohydrate sources on hand that are super easy to prepare and eat when short on time or low on willpower. If you fail to plan then you plan to fail. Smart carbohydrates like fruit in a fruit bowl (make it nice and visual) are always handy as quick and easy choices when you’re short on time and need something with minimal prep and work. Smart carbohydrates oats, quinoa, and rice are great to keep in your cupboard as versatile staples which can be prepared fairly easily with some quick cooking or microwaving. Smart carbohydrates like beans, chickpeas, and lentils can be prepared overnight or bought pre-prepared and kept in the fridge so that they are ready to eat the next day. Smart carbohydrates like butternut, potatoes, pumpkin, and sweet potatoes can be stored in a cool dark place fairly well and then in the fridge after cooking / cutting. Getting into the habit of eating smart carbohydrates doesn’t need to be complicated or super fancy. It just requires a bit of effort up front, and then a system that you can continuously and regularly maintain. You will come to learn which foods you need to buy frequently and which foods you only need to stock up in bulk once in a while.